Long before I became a beauty blogger, I never saw the importance in "skin care." I'd wash my face but that was about it! I never tried different products, just stuck with the same old face soap. And I wondered why I was getting pimples? Luckily, I've learnt, and in learning I've discovered one of my favourite types of skincare is definitely a good scrub! Since it's Summer now (not that Australia's weather has entirely made up it's mind about that yet) it's important to make sure I take extra care in cleaning my skin, so a scrub is perfect for this kind of weather! 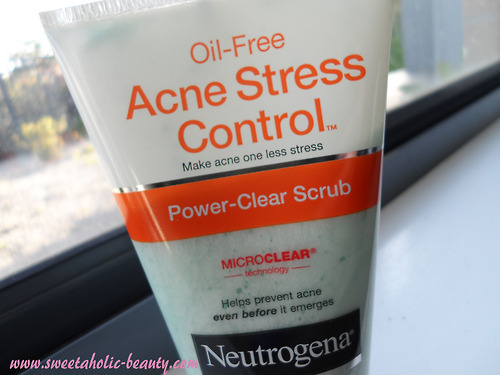 I've started using Neutrogena Oil-Free Acne Stress Control Power-Clear Scrub! I'm not sure if that's the whole name, or which part is the real name, but I'm just going to call it the Power-Clear Scrub! The Power-Clear Scrub is what it says it is, an acne stress control scrub, using microclear technology. Basically that means it has lots of gritty scrubby bits to get in there and really exfoliate the skin whilst cleaning it. The idea of this scrub is that it is supposed to prevent acne even before it emerges. Well, isn't that what the word prevent means? Either way, I like the sound of it! This is specifically designed for those with acne-prone skin, which can really be anyone if you don't take care of your skin! This formula includes a few soothing ingredients, such as green tea and cucumber, all to relax your skin! 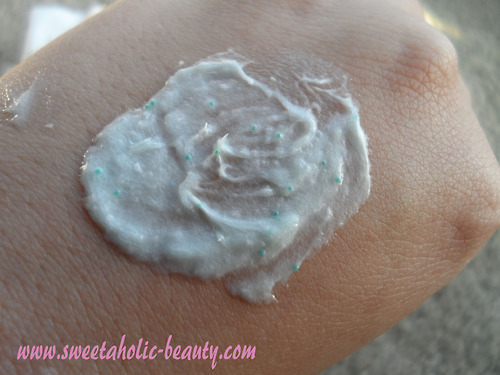 Of course, as it's a scrub, it also includes the fun microbeads that exfoliate too! The only thing that had my alarm bells ringing was the sunburn alert. The back of the tube says that this product contains an AHA (Alpha hydroxy acid) which can increase your skin's sensitivity to sunlight, and help you sunburn easily. I don't think that I've ever used skincare with this in it before, so I found it really odd, as it's something that can be found in medication. In saying that, if you keep up your sunscreen like a good girl (or boy) you'll be absolutely fine! Close up of the product. The Power-Clear Scrub is a lovely light green colour, and is very moisturising! When using it on my face, I can feel the microbeads doing their work, but I can also feel how incredibly soft and smooth the creamy part is! As you can see, it's chock full of microbeads! I loved the way this product made my skin feel. It felt incredibly soft and supple, and not at all dry or tight. This really helped my skin retained moisture and helped my skin stay smooth. I did not have any breakouts at all using this product, and at one point, I could feel a super nasty pimple coming up on my chin (one of those blind ones that are truly evil) but it never came to a head and disappeared after one or two days. 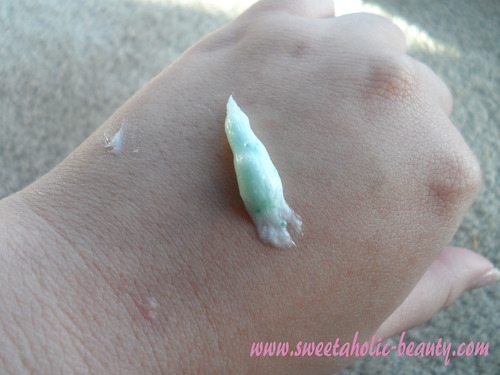 This shows how good the Power-Clear Scrub is at preventing acne! I had high hopes for this scrub, and it definitely lived up to those hopes! I would absolutely recommend using this one, especially for those who are acne prone, or those who just want to keep their skin clean! 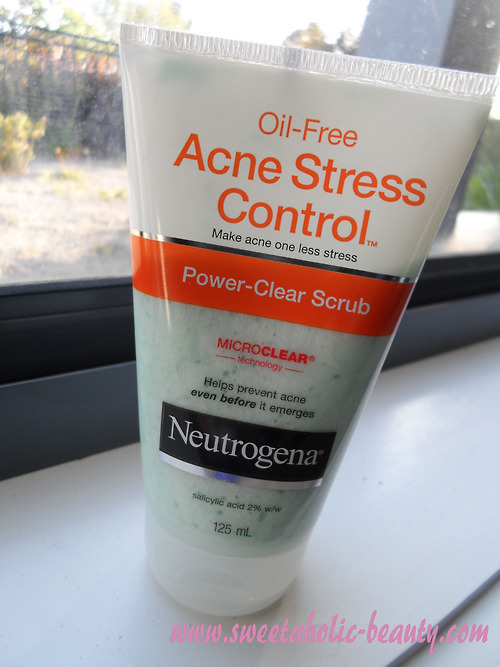 Have you tried the Neutrogena Power-Clear Scrub? If so, what did you think? 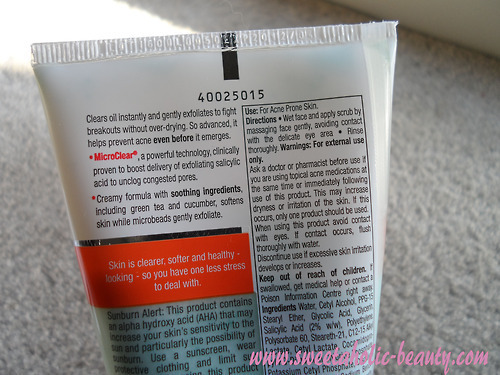 I have not tried this specific one but I love Neutrogena skin care! Seems really good for acne-prone skin! Who doesn't want something that can keep blemishes at bay? :) I like the sound of how cooling/refreshing it is too! OOOO! I've always wanted to try a product with AHA in it. Since I know that you love gritty scrubs as much as I do, will definitely be trying this next! wow i never heard of this one.. i usually use the blue one from neutrogena and that's great too! I used to use Neutrogena cleanser and moisturizer, but it was too agressive for my skin. now I mainly use natural products. I have really sensitive skin. I love Neutrogena as well, and I've only heard good things about the rest of their products so hopefully this is a winner for you! I hope you do subscribe hehe! I'll check you out too!